ENO CamoNest Hammock. 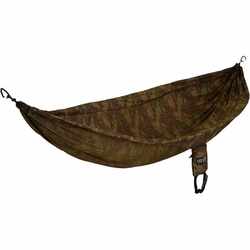 Blend in to your environment, whatever that may be, with the ENO CamoNest. As versatile as nature is varied, the CamoNest provides the perfect hidden nirvana. Whether you're out on the hunt or relaxing among skyscrapers, kick back and hide away with the CamoNest. The ENO CamoNest is the equivalent size of the ENO SingleNest. Eagles Nest Outfitters.